Generally wealth has to do with achieving some sort of material goals and this usually comes from the career you choose unless you’re one of the lucky ones born into family fortunes. Heredity brings with it another set of spiritual lessons and a different look at your astrology. Most though are not fortunate enough to have been born into families laden with material success. Because of that we need to consider the best employment we can utilize to make us wealthy, healthy and happy. You thought I’d say wise but that comes with other aspects of life too. Being healthy and happy aids in your career whatever it may be. You can have the best career in the world but if you’re unhappy you can develop disease because of your unhappiness. Then you’re no better off than someone who has nothing. After all, you can’t take it with you when you die. And getting to the point of death can be horrible. For that reason, determine the best career choice for yourself and go after it with gusto. Then enjoy your life. While you’re enjoying your life a different kind of wealth is there. As you know wealth isn’t always material but that has a lot to do with making you happy. When you don’t have bills piling up and creditors calling you can live an easier if not better life. When you can afford to go out occasionally and enjoy being with friends, that’s true wealth. Knowing what you want in life is the best advice anyone can give. Realizing that your astrology can assist you in that knowledge is truly a God-send. You’re born and grow up knowing your innermost personality traits. Using Astrology you can go the extra mile to understand why you have those characteristics. This is an aid to your learning the best manner in which to harness those personality traits to make you realize your goals towards material victory. With that one extra tool in your arsenal you’ll be able to contribute to your success and hopefully wealth. 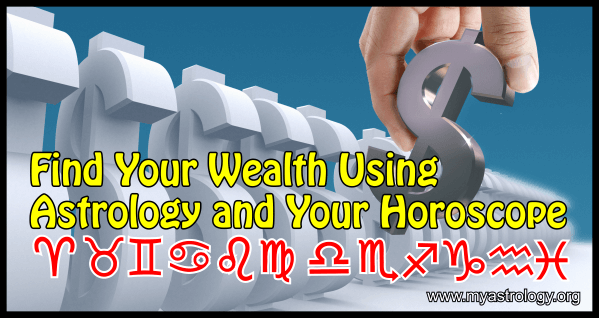 Find Wealth Using Your Astrology and Horoscope will give you some of the astrology tools needed to help you make intelligent decisions on your own expectations in which to mold your career and make the best choices. Astrology encompasses your whole natal chart, progressions and aspects. To make it easier for you we’ll look at your Sun Sign and Ascendant more closely than anything else. Because astrology can go on and on without you’re really ever learning it all, we’re simplifying in a big way. You realize by now that you need to have your personalized astrology in order to get the best results for your work. While using astrology can help you get further in your chosen career you know that you need to work strongly at your job in order to achieve the success you crave. Regardless of sign you can only achieve the accomplishments you desire by sincere thought and work. Sign does, however, matter in that some have more work ethic than others.